Widget displays Mt. Erebus Volcano Observatory Eruption Log. Is there a better alternative to Mt. Erebus Volcano Observatory Eruption News? Is Mt. Erebus Volcano Observatory Eruption News really the best app in Personal Info Managers category? Will Mt. Erebus Volcano Observatory Eruption News work good on macOS 10.13.4? This widget displays the ten most recent entries from the Mt. Erebus Volcano Observatory Eruption Log. It gives links to information on the most recent eruptions and statistics about the volcano in Antarctica. Each entry can be clicked and will take you to the article in the Eruption Log. If you have any comments or questions please email Kyle. volcanophile@mac.com. There is an updated eruption scale on the back as well as clickable links to the National Science Foundation, United States Antarctica Program, New Mexico Tech and the Mt. Erebus Volcano Observatory. 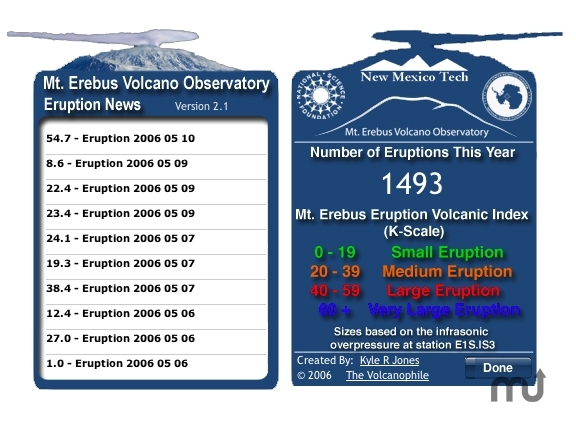 I have also added a "Number of Eruptions This Year" section that updates when the widget is opened or restarted. The RSS feed now refreshes automatically. Mt. Erebus Volcano Observatory Eruption News needs a review. Be the first to review this app and get the discussion started! Mt. Erebus Volcano Observatory Eruption News needs a rating. Be the first to rate this app and get the discussion started!